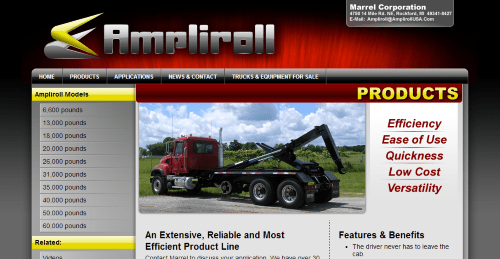 Ampliroll is a product of the Marrel Corporation which provides the US market with a wide range of Ampliroll hook lifts and a full range of support of services. Their headquarters are located in Rockford, Michigan. A nationwide dealer network provides local support to their customers. “Marrel invented the hook lift”, they inform us, and in 1969 their invention became successful in the US market. We understand from their company information that the wide range of Ampliroll Hook lift Systems which are offered by Marrel, has enabled the company to build an enviable reputation for reliability and for superior design. Visit the Ampliroll website here.